NINA KOKELJ (1972) graduated from the University of Ljubljana’s Faculty of Economics and the Faculty of Social Sciences. 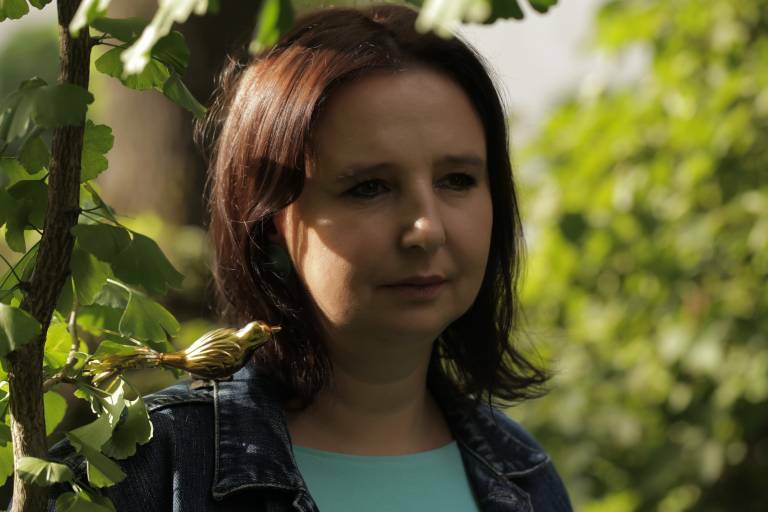 She is the award-winning author of five novels: Milovanje (Grace) – for which she won an award for the best first novel and for which she earned the distinction of being the “Youngest Little Firefly” – Sviloprejka (Silkworm), Poletje s klovnom (A Summer with a Clown), Slamnata dežela (Straw-Country), Piši mi, ko ti bo najlepše (Write Me, When Things Are Most Beautiful for You), as well as the youth novel Sibidusovo kukalo (The Lens of Sibidus), created in cooperation with the actor Jan Bučar. She has also written a number picture books. Her book Deček na belem oblaku (The Boy on the White Cloud) received the distinguished “White Raven” title at the Bologna Children’s Book Fair. Nina Kokelj’s works have been translated into English, Albanian, Macedonian, Serbian and Czech, and published in literary magazines and books, among them, Slovene Studies (“The Beggar”) and Dalkey Archive Press’s Best European Fiction (“Early Butterfly”). She has participated in several literary festivals and public readings across Europe, including the 10th “Slavic Embrace” Festival of Slavic Poetry in Varna, Bulgaria, the 10th International Book Fair in Podgorica, Montenegro, and at the festival fluSSidiverSi – Poesia e poeti di Alpe Adria, Caorle. She often brings her literature to children in kindergartens, schools and libraries. Her literature intertwines lucid magic realism, goodness, brotherly love, eroticism and compassion; her heroes quaver in the ether, as if they were dancing to the rhythms of Cesária Évora’s songs. With Saška Rakef she has created the Most Beautiful Day. And the Literary Clowns came to call at the concrete apartment settlements.